This is a day off, no nautical miles, just a lot of running around, a day to relax during our three month vacation while on retirement ! We are not, however, spared continuous rain. Still, nothing can spoil the freedom to sleep in, wander around aimlessly and having no chores to do except pre-clearing Immigration and Customs for tomorrow as we will land first, away from the Ketchikan office, in Foggy Bay. Dunnery is also checking tides and weather, and minimizing the wave size in his report to me! I am preparing loads of salt and vinegar potato chips, soda crackers and tonic water to prevent sea-sickness. Also a big thank you for all the comments you post. We love hearing from all of you, so please give us news, we like it very much! 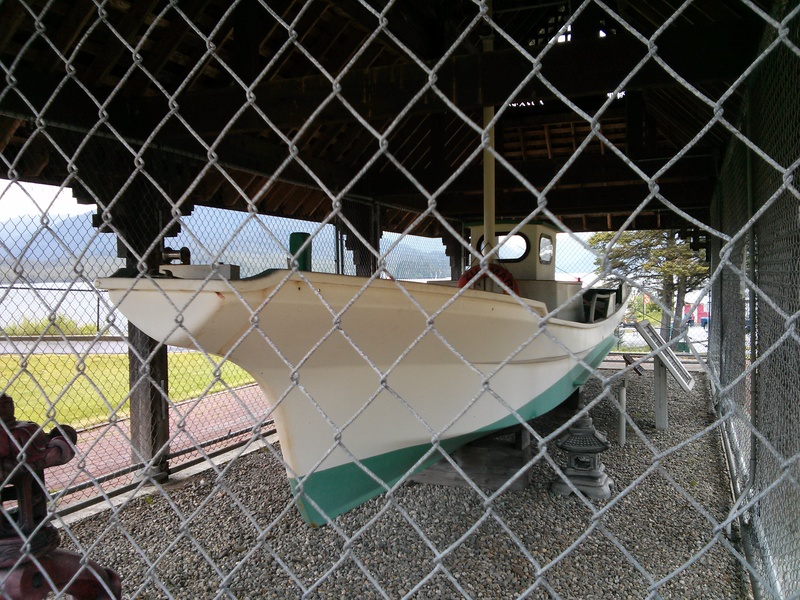 A great artifact on the ocean front is a little Japanese fishing boat. Read its story, it is so tragic and sweet at the same time. 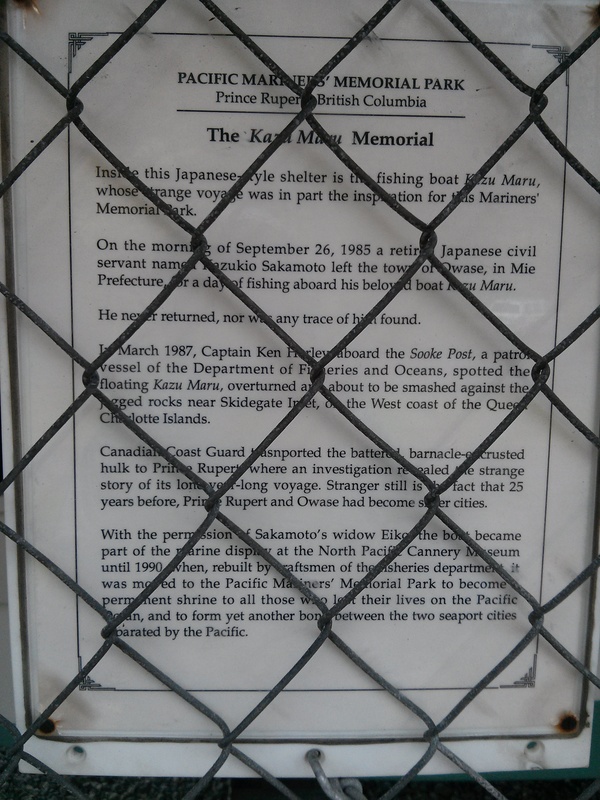 Interestingly, the Japanese man’s home town is a twin-city to Prince Rupert. 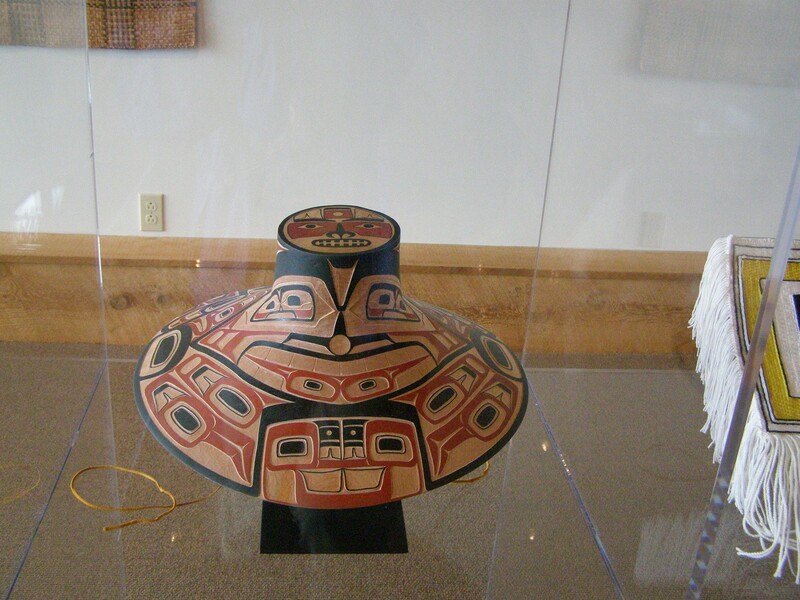 We Visited the Museum of Northern BC, a gem of Tsimshian treasures, old and more recent, presented in wonderful long-houses on the water. 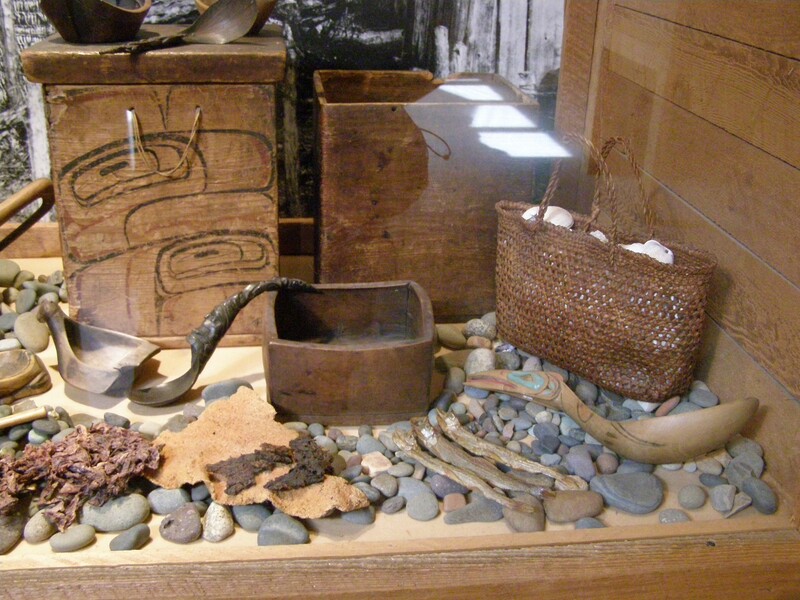 This entry was posted in The Log and tagged Inside passage, Museum of Northern BC, sailing. Bookmark the permalink. So interesting,really enjoying your blog. Doing a great job Francoise. The pictures a fabulous,the sky,the mountains with snow,the ocean, each picture is a masterpiece. We have had a lot of rain here as well but are getting a few plants in. Had a fun time at Kate’s graduation party. Driving home that night on the 401 is as much excitement as we can handle! Had a nice chat with Nick a few days ago, will be seeing him soon and a postcard from Celine with a promise of a letter to follow. Of course beating someone in scrabble makes my day, ha ha. Its a classic late Spring day in Toronto with everything in full bloom and multi tones of green illuminated by the bright sunshine. 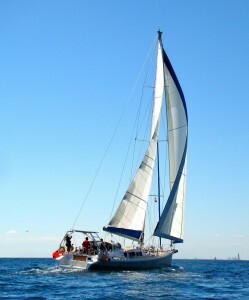 Please keep mentioning the rain because it helps to dampen my envy of your great sailing adventure. Many of us dream of such things and its nice to know someone who actually attempts them. Your former house sold again a month ago ($2.1M) and has been under renovation ever since (2 dumpsters so far). We’re astounded as you and Melanie Allen had done everything so well. Off to Ucluelet early July for 3 days fishing with Duncan and his son Rowan; 3 genearations should be able to catch something! Dunnery and Francoise: Thank you for your updates and we are enjoying the stories and history of your travels. Take care the Owen-Flood family. I know this museum! A little white dog went there with us once.